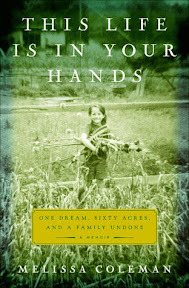 This Life is in Your Hands [Book Review] – my books. my life. We know all along that Heidi is going to drown. We know all along that this “idyllic” life is not going to survive Lissie’s childhood. Even before the book begins, the publisher’s summary spells it all out. But the journey to this inevitable end is very much worth reading. Melissa (“Lissie”) Coleman’s memoir recalls the first ten years of her life. It’s the 1970s and her parents, Eliot and Sue, decide to leave their old lives behind and move to a farm in Maine to being homesteading (they purchase land from Helen and Scott Nearing – famous for their own book Living the Good Life). “Lissie” is born shortly after followed by her sister Heidi a few years later. The family spends summers farming and selling their produce with the aid of various apprentices interested in the back to the land movement. The winter is spent trying to survive the harsh Maine weather. They are successful with their organic farming, less so with their family life. Lissie is often ignored and the kids are allowed to run free most of the time. The tragic event of Heidi’s death that finally breaks the family does not occur until the last 70 pages. The first part of the book describes the life – the reasons for it, the tools and methods, the way it made Lissie feel. At first it seems like a perfect solution to the problems plaguing society. But the work is hard and the family suffers for it. Although we know it’s coming, Coleman does such a good job dealing with the tragedy and the aftermath that I found myself tearing up, trying to suppress that lump rising up like Lissie. Her father’s anger and stubbornness, her mother’s depression, and her inability to change any of it is heartbreaking. It’s a book that will make you evaluate the important things in life as you reflect on the Coleman’s attempt at homesteading. This memoir is touching, well-researched, well-written, and honest. I find it interesting that the major event is highlighted on the jacket copy, but doesn’t actually happen until the very end of the book. That tactic could have been ruinous, but from your description, it sounds like it works. I have to admit that I am really very curious about this book now, and want to take the time to check it out. You wrote a really compelling review! Sounds like a difficult read but one that is worth to get to know this family. I’ve read books like that, where the BIG EVENT happens late in the book, and you know about it. If written correctly, though, that builds so much tension. It’s coming and you can’t stop it and you have allowed yourself to become attached. Unlike a surprise death, when you don’t even know to be scared. I think maybe my fantasy of homesteading with chickens and goats might just be nipped in the bud if I read this one. Ooh! I’ve never heard of this one. I’ve been looking for a good memoir to read soon! Might have to pick this one up. This sounds like a pretty heavy and thought-provoking book…I need something like that right now! I liked this memoir a lot too. I admired the way she revealed the big tragedy in the end, but then so successfully built too it, keeping the emotion in the book throughout. This is exactly the sort of memoir I like reading.